Although this post is sponsored by OREO (thanks OREO) all thoughts, opinions, and ramblings are my own. It is now the most wonderful time of the year! I love the holidays more than anything, you guys. I love every single little thing about it, it’s all in the details. And there are just so many fun details and ways to show our family love though the little things. That’s why I love this recipe. I thinks it’s so fun to create something unexpected and special. 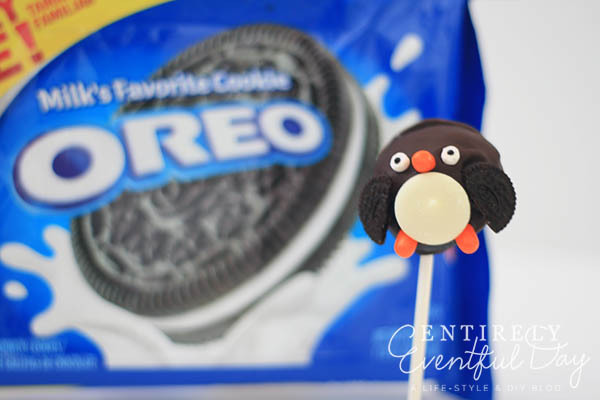 I am not kidding you, my kids nearly fell off their chairs when I showed them these OREO Cookie Ball Pops. My daughter wanted name one and keep it for a pet… they are that adorable. 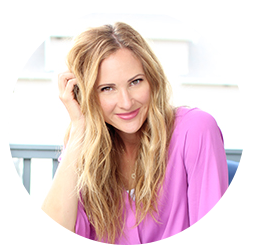 I know you are excited to get started… here’s what you’ll need. 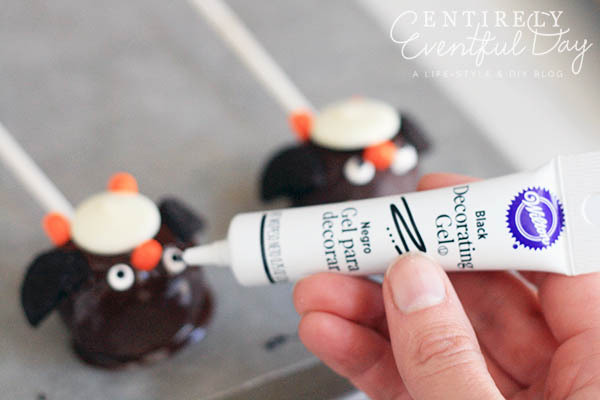 Mini candy button eyes - You can substitute the white candy coating wafers melted and piped into little circles, topped with a dab of black cake decorating gel. I used mini marshmallows (found in the cake decorating section of the craft store) and a dab of gel. 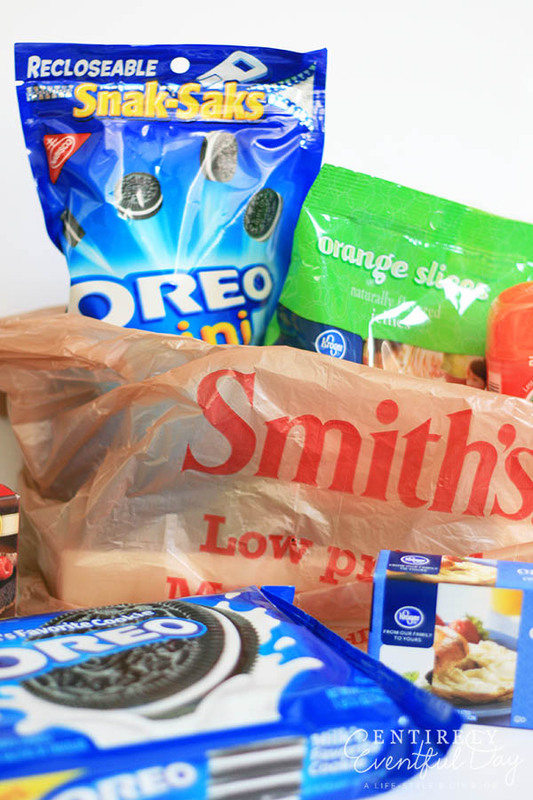 I got pretty much everything I needed at Smith’s. Love that place. I used to go out of my way to shop there and I forgot how awesome the prices are. I will totally be going back! 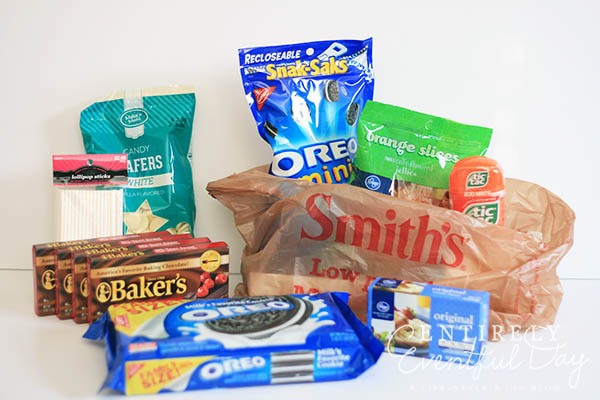 I have to say that of all the store brands, Kroger is my absolute favorite. This is off topic, it’s my blog so I get to do that, the Kroger sour cream is literally the best sour cream on the planet. Trust me. 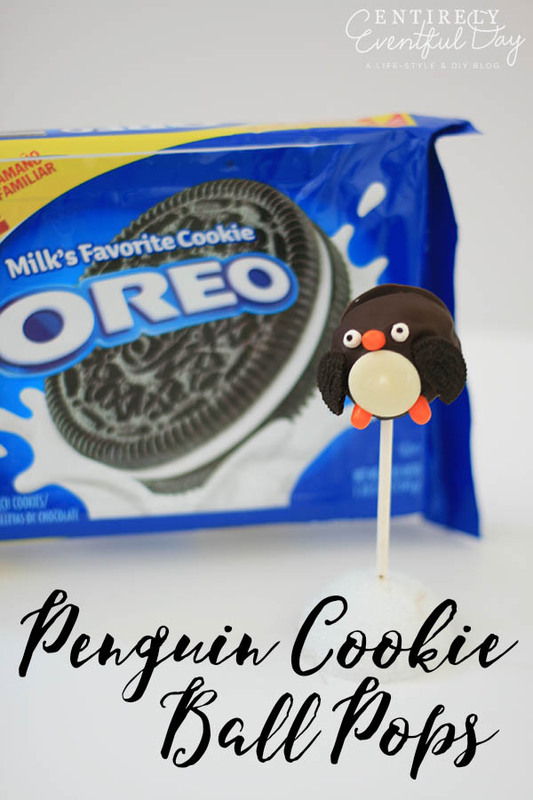 Back to the cookie pops ;). I figured if their sour cream is amazing then their cream cheese might be too, so I gave it a try. Yep! Find your local store HERE. Okay, I know you are all super smart, but I have to admit that I can be a little dumb sometimes. Case in point, as I was looking at the list of ingredients, I thought to myself, “Maybe I could just melt chocolate chips…” Um, no. The baking chocolate is on the list for a reason! This stuff hardens up much better than melted chocolate chips. Silly me. Okay, let’s make these babies! 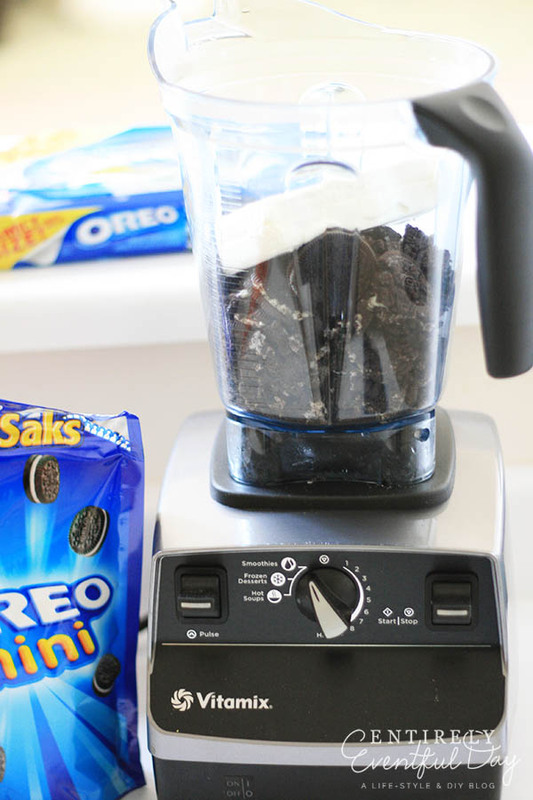 First thing you want to do it to crush your OREO Cookies. I happen to have a Vitamix so I put it to use. You could also put them in a strong zipper bag and have your kids jump on them… my kids were at school or I am sure they would have loved it. You might notice that I blended my cream cheese in at the same time… yeah, don’t do that. My blender heats when it blends and I had to put the mixture in the fridge for a while for it to cool back down. It all worked out though and they turned out so cute! Next, make a 1 inch ball with your mixture. I put a little bit of cooking oil on my hands while doing this… just because. Don’t worry, I didn’t measure every ball (I’m not that crazy), just the first one and I based the rest of them on the first. 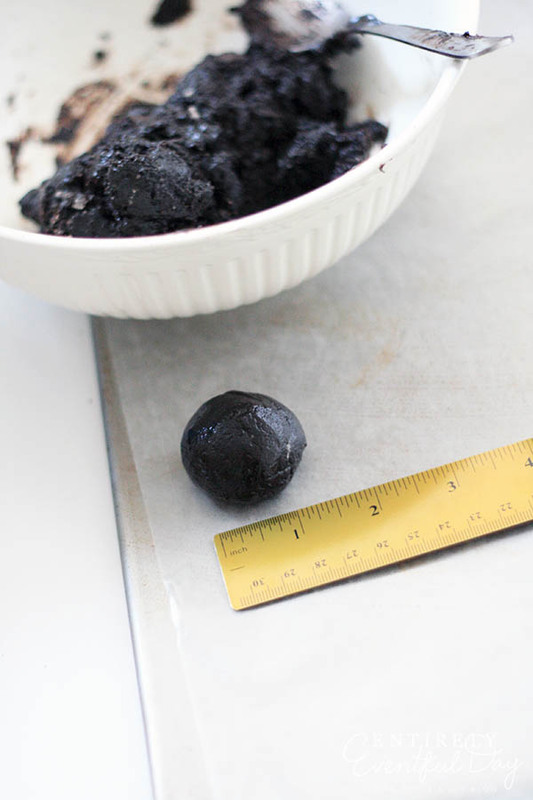 Place your balls on a sheet of wax paper over a cookie sheet and pop them in the freezer for 10 minutes. On a personal note: I had to run an errand at this point and I left them in the freezer for a couple hours and they still worked great. 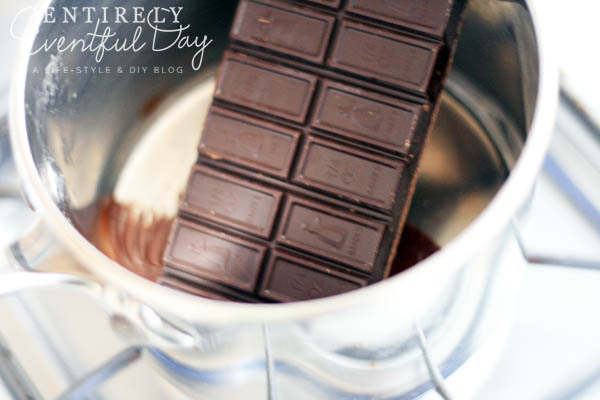 Now carefully melt your baking chocolate over low heat a let it cool for a few minutes. I discovered that if the chocolate was nice and warm but not quite hot it was easier to work with and my pops ended up looking much better. 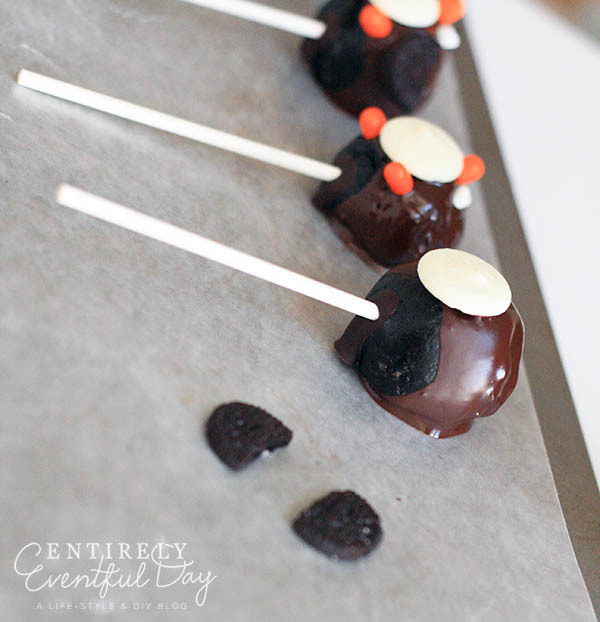 Dip your lollipop sticks into the melted chocolate and then insert them into your cookie balls. Genius! This acts like a sort of glue. At this point, I put my pops in the freezer for just a few minutes to let the chocolate do it’s thing. Now it’s time to dip. Remember don’t dip into hot chocolate, let it cool until it’s nice and warm. Also, have you ever seen someone dip a Carmel apple? Or maybe you’ve done it yourself? 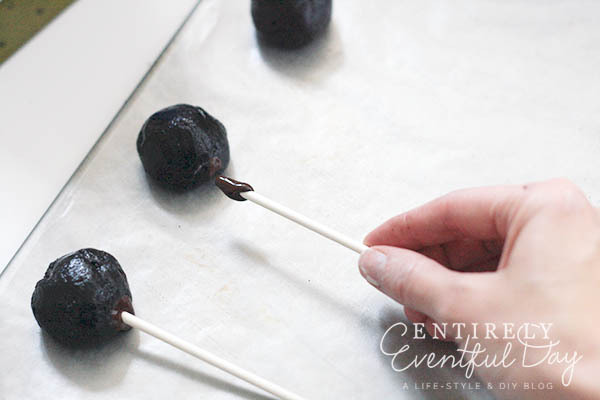 To get a nice thin coat of chocolate, dip first and then twist the lollipop stick back and forth in your fingers to sort of spin the pop and get rid of the access chocolate. 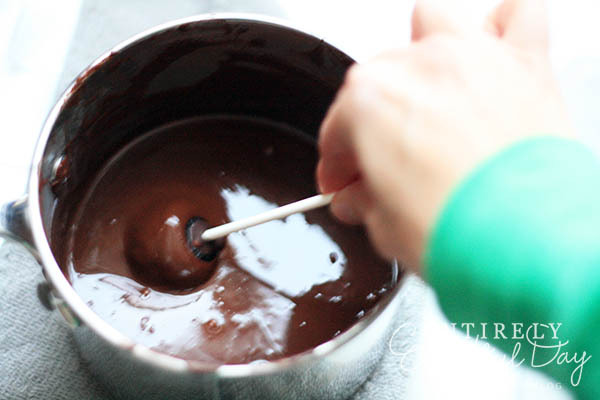 Then place your chocolate covered pop on the wax paper. You’ve got to act kind of fast now because the chocolate will begin to harden. First add your white candy coating wafer. I added the beak and feet next and that helped secure the wafer in place. Then I added the mini marshmallow eyes. 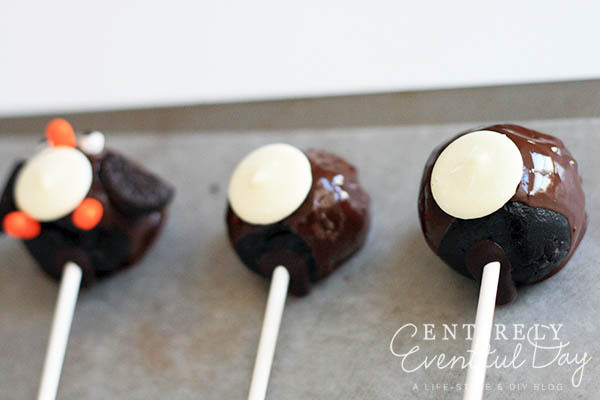 Have your wings ready to go because at this point the chocolate it hardening. At first I tried to cut the mini OREO Cookies in half to make the wings but that didn’t work out very well. I found that breaking them worked best. I didn’t break them straight down the middle, there seems to be a place where they break best… experiment a little. Then I took a small knife and straightened out the broken part. Perfection :). The last thing I did was to use black decorating gel to finish off the eyes. The trick is to wipe the tip after every dot. That way you get the nice clean look you are trying to achieve. I think you will find that each of your little guys seems to “come alive” at this point, and like my daughter, you will have to resist the urge to name them and take them on walks.